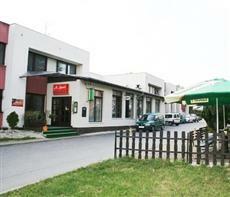 The A Sport Hotel Brno is located only a few kilometers from the city center. Guests will find that the hotel offers convenient access to the trade fairs. The TG Masaryk motorbike circuit and the historic district are also within easy reach. The A Sport Hotel Brno is located near the D1 motorway. Public bus stops are also located nearby, offering travelers easy transportation to all of Brno’s most popular points of interest and to the nearby Brno airport. Each of the guestrooms at the A Sport Hotel Brno offers a simple but comfortable décor. All rooms are designed to offer convenience and comfort and are stylishly designed. Each room includes a private en-suite bathroom. Guests of the A Sport Hotel Brno will find many of Brno’s shops and restaurants within walking distance of the hotel. There is both a bar and a restaurant onsite as well. Other hotel amenities include a lounge and a ticket area as well as a fax area.